this following information is only for reference. 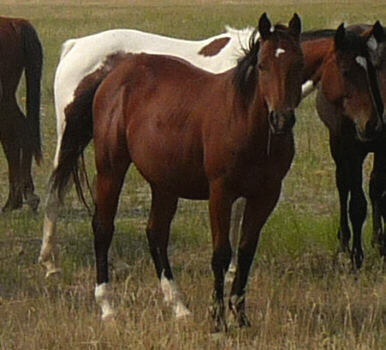 Colts by Plentyofit Freedom, a grandson of Doc's Hickory. 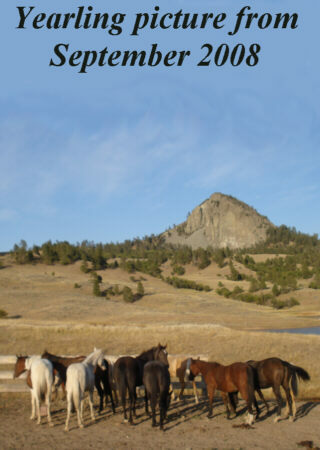 These colts were born in July and August 2007, their dams are proven ranch mares with working cow horse bloodlines. 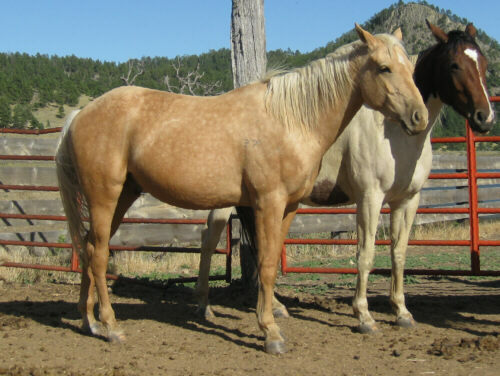 The colts are registered with AQHA, their pedigrees are listed at allbreedpedigree.com. They were worked with as 2year olds in the summer (few rides in the round pen, at least one ride outside) before we brought them back to pasture to grow out. Gelded end of August 2009. Please find details about these colts below! Fillies by Plentyofit Freedom, a grandson of Doc's Hickory, and Dorky Frosty Spark, our own son of Frosty Feature. 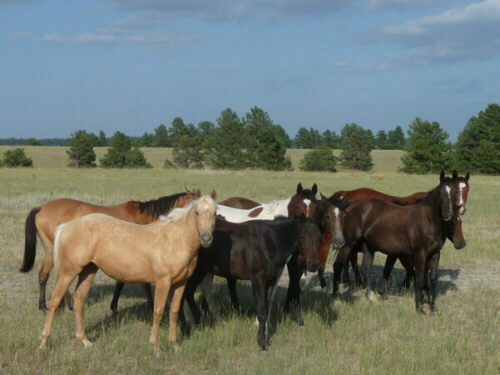 The dams are proven ranch mares with working cow horse bloodlines and a few speed bred mares. 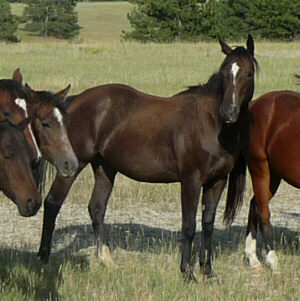 These fillies are registered with AQHA, their pedigrees are listed at allbreedpedigree.com. Please find details about these fillies below! 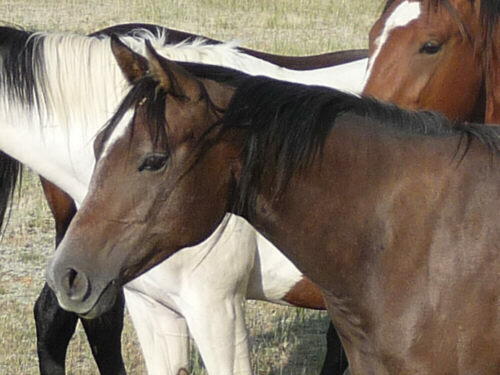 Cream is a gelded colt by Plentyofit Freedom, an own son of Plentyofit and grandson of Doc's Hickory. 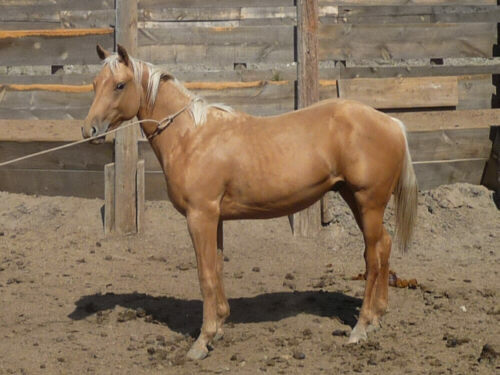 He was born in July 2007, his dam is Watchs Golden Girl, a palomino ranch mare with working cow horse bloodlines that go back to Tyress Watch and Doc Bar. He was worked with last summer (few rides in the round pen, at least one ride outside) before we brought him back to pasture to grow out. He already rode off on his first ride like a pro. Not knowing better we would have thought he is already broke. Very mellow and laid back personality, but with his breeding he will watch a cow and look unique while doing it. See his pedigree at http://www.allbreedpedigree.com - he is registered with AQHA. 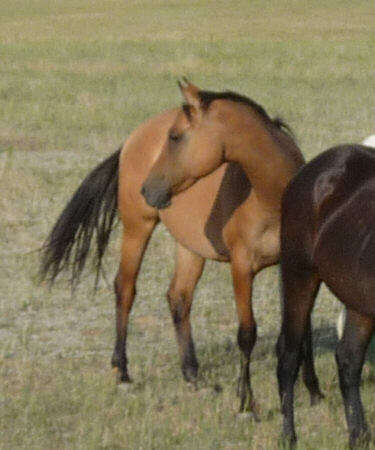 This is a gelded colt by Plentyofit Freedom, an own son of Plentyofit and grandson of Doc's Hickory. 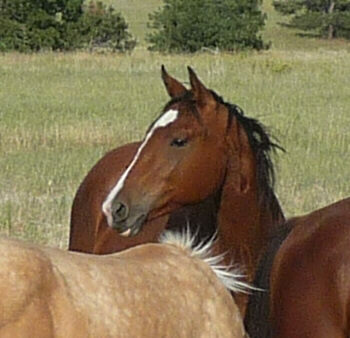 "Leo" was born in July 2007, his dam is Karileo Wind, a red roan ranch mare with working cow horse bloodlines. He was worked with this summer (few rides in the round pen, at least one ride outside) before we brought them back to pasture to grow out. Hygro is a gelded colt by Plentyofit Freedom, an own son of Plentyofit and grandson of Doc's Hickory. 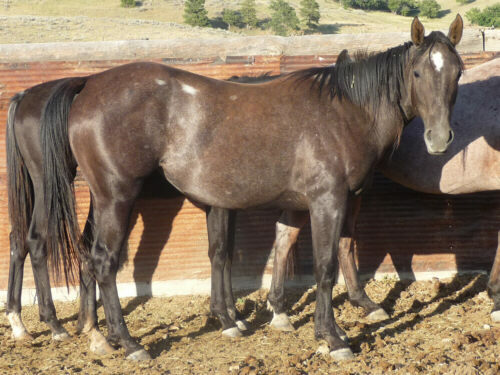 He was born in July 2007, his dam is a proven ranch mare with working cow horse bloodlines. He was worked with last summer (few rides in the round pen, at least one ride outside) before we brought him back to pasture to grow out. He will have some go to him and be quick - something to look for in a working cow horse prospect! Cherry is by Plentyofit Freedom, an own son of Plentyofit and grandson of Doc's Hickory. He is heavy bred for the cutting and team penning arena and has all the cow needed on the ranch bred into him. Born and raised on a ranch in very rough country has prepared him for trail riding as well - no spook or fear of crossing natural obstacles in this guy! 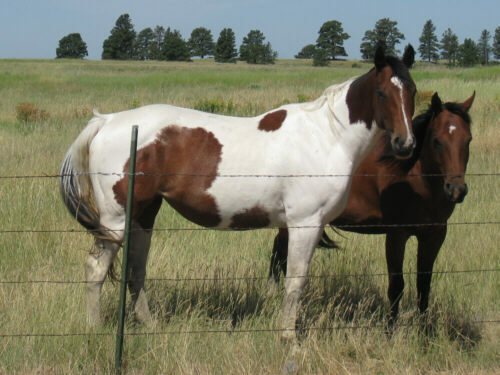 His dam is a proven ranch mare with working cow horse bloodlines and one of the prettiest mares we have. He will probably mature around 14.2 hands. He was worked with in summer 2009 (few rides in the round pen, at least one ride outside) before we brought him back to pasture to grow out. He has a very friendly disposition and loves people. "Pep" was born in July 2007, his dam is a proven ranch mare with working cow horse bloodlines (Peppy Docsan still on his papers). We wanted to keep him as a stallion prospect but decided that we have too many horses as is. 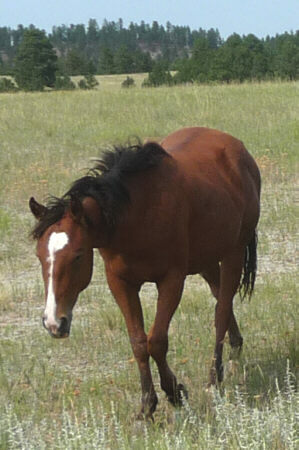 Freedom Catolena is by the Doc's Hickory grandson Plentyofit Freedom and out of a Doc O'Lena and Sun Frost bred dam. Lots of cow and speed in her breeding! 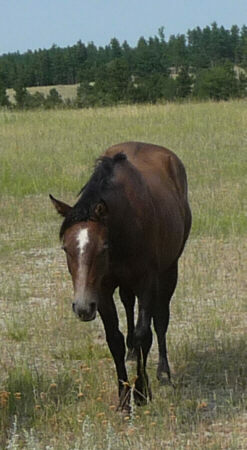 She has a very sweet and mellow personality, was halter broke as a yearling and easy to catch this summer again. 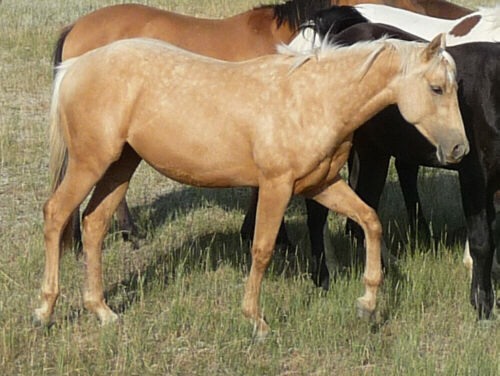 See her pedigree at http://www.allbreedpedigree.com - she is registered with AQHA. 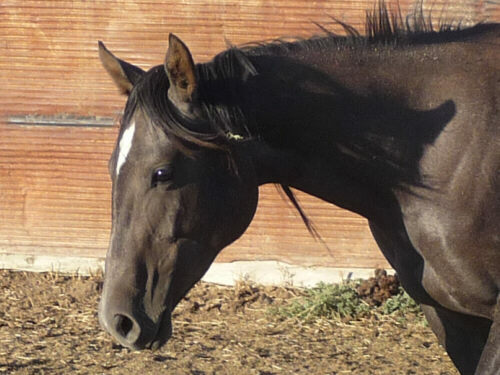 Princess is a coming 3yr old paint filly with a beautiful coloring and dark eyes. She handles good, leads, ties, loads, had some ground work done and is ready to start under saddle. She was used for 4H as a yearling and has seen the show pen, but she has been out in the pasture since then. Sweet disposition, no kick or bite. She stands 14.2 hands and will probably mature around 15 hands. 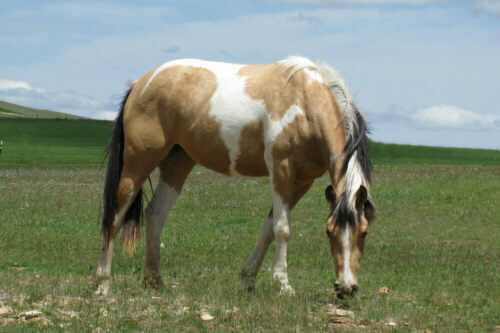 See her full pedigree at http://www.allbreedpedigree.com - she is registered with APHA. Three Bars, Buck McCue, Sunny Dee Bar and others just slipped off her papers. Frosty Ilrice is by our own son of Frosty Feature and out of a speed bred APHA mare. Her pedigree sports AAA and AA race winners. With Frosty Feature on top and Whizz Blitz, Jet Deck, Native Dancer, Duplicate Copy (x Go Man Go) on the bottom of her pedigree she is bred to perform. She stands about 15.1 hands and is halter broke. See her full pedigree at http://www.allbreedpedigree.com - she sells grade. Frosty Jeep Three is by an own son of Frosty Feature and out of a proven broodmare with working cow horse bloodlines. She is ranch raised, hardy, used to rough country and stays healthy in the worst weather conditions. 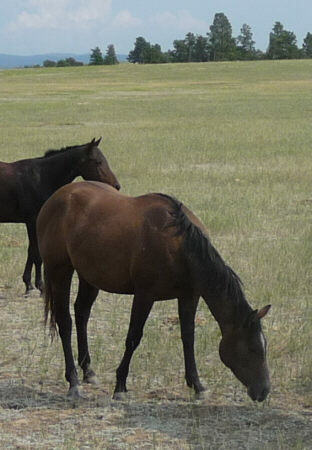 Jeep has a big hip and will get very stout; with her speed breeding on top she should make a great roping horse. 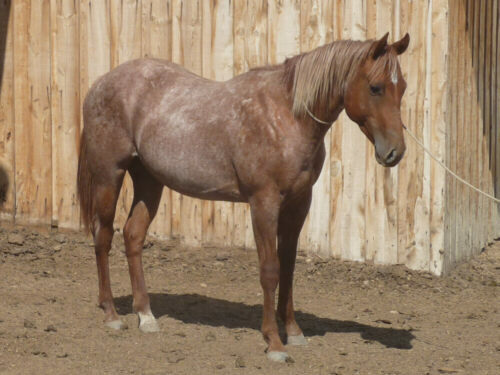 This filly has it all: looks, color (turns gray), and the right bloodlines to run the barrels. Frosty French Sundan is by an own son of Frosty Feature and out of a granddaughter of Frenchmans Guy. She is ranch raised, hardy, used to rough country and stays healthy in the worst weather conditions. Bubba's Peach is by MB Bubba Doc and out of Utopian Peach. 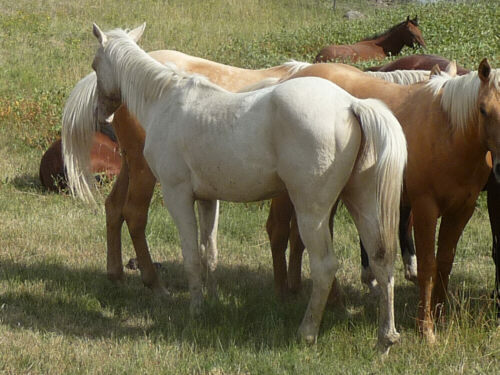 Both horses are used in our guest ranch business to work cattle with guests who want to play cowboy. 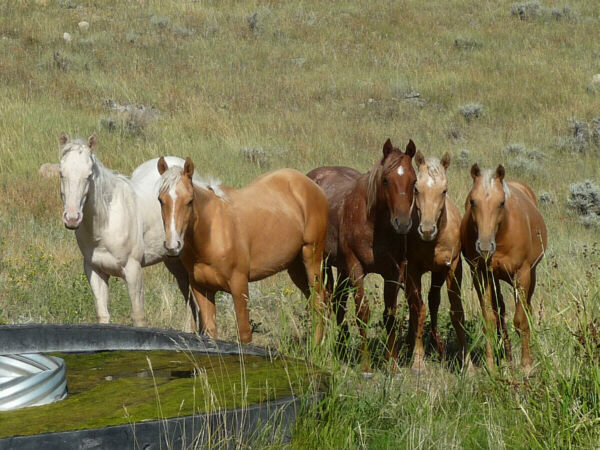 They are gentle enough to trust them with all kinds of riders but have enough "go" to work cattle and gallop with the tourists over the prairie. MB Bubba Doc was used as a breeding stud before we gelded him a couple of years ago - not before he got into our herd of riding horses and fell in love with "Peach". Unfortunately we missed that little incident and didn't file a breeding report for the stud - until we found out what happened the registration fees got too high. See her pedigree at http://www.allbreedpedigree.com - she sells grade. Frosty MB Pipse is by an own son of Frosty Feature and out of a proven broodmare with working cow horse bloodlines. 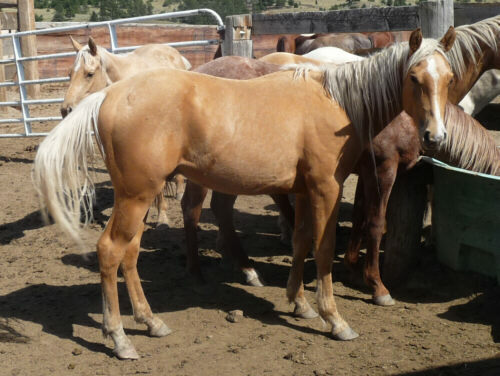 Frosty Rivr Dust is by an own son of Frosty Feature and out of a proven broodmare with working cow horse bloodlines. She is ranch raised, hardy, used to rough country and stays healthy in the worst weather conditions. 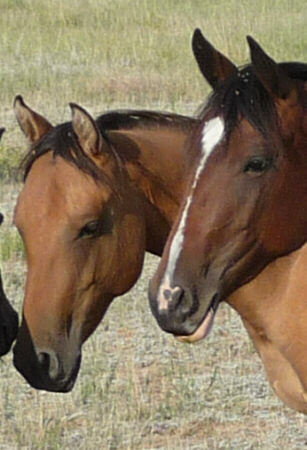 Frosty For Sunday is by an own son of Frosty Feature and out of a proven broodmare with working cow horse bloodlines (Zan Parr Jack on the top, Poco Bueno on the bottom). She is ranch raised, hardy, used to rough country and stays healthy in the worst weather conditions. With speed breeding on top and cutting on the bottom she will be fast and quick and can go in any direction: run barrels or work work cattle with. This lady will cover country. 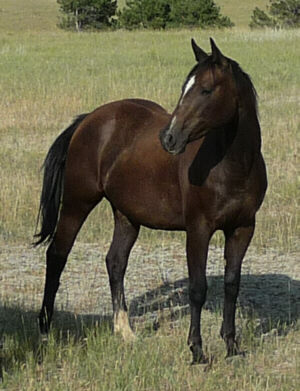 Sahara is a 3yr old half Arabian filly with a stunning color. 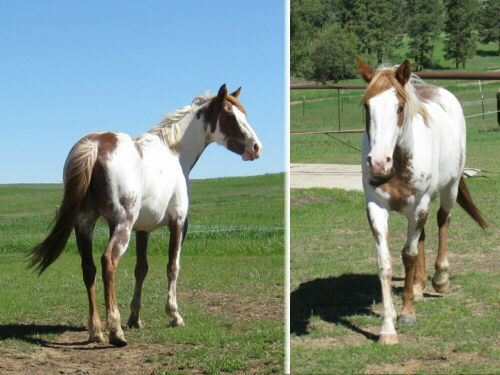 Her sire is a registered APHA stallion, her dam a purebred Arabian. Sahara is registered with the Arabian Horse Registry. 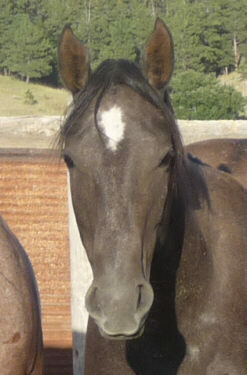 She is a laid back kind of horse, stout build and will be fairly tall. She handles good, leads, ties, loads, had some ground work done and is ready to start under saddle. Sweet disposition, no kick or bite. She stands 14.2 hands and will probably mature around 15.1 hands. See her full pedigree at http://www.allbreedpedigree.com - she is registered with HAHR. Her dam is a granddaughter of Huckleberry Bey.